Under the proposed tax system, the form below could replace all your federal forms and schedules and state income tax forms. (There would only be one additional schedule for those with a small business.) There would be no capital gains taxes, sales taxes, use tax, property taxes, estate tax, or tolls. Practically anyone could fill it out in about one hour without needing a tax preparer. There could be online and spreadsheet versions in which, after you fill out 25 lines (the yellow ones below), the calculations would be done for you. In fact, since nearly all figures are from forms both you and the IRS would receive, the IRS could send you a pre-filled form. You would then need to confirm or correct the information, sign it, and send it back. 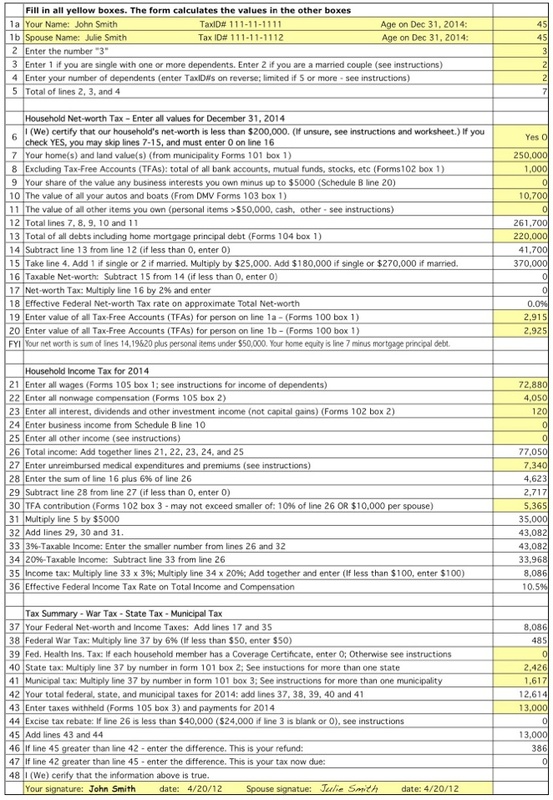 Best of all, filling out the simple form demonstrates how everyone’s taxes are figured. You could send it in, content in the knowledge that everyone is playing by the same rules and paying their fair share. The form below is filled out with the tax information for the Essay's hypothetical middle-class Smith family. It does not include their projected excise taxes of $2100. Excise taxes would be paid at the time of purchase of excise items, like cigarettes and fossil fuels.